Home / News / Volunteering for all – all year round! As thousands of volunteers are being celebrated up and down the country as part of Volunteers’ Week, we of course couldn’t let the moment pass without three cheers for our incredible volunteers who give their time and energy all year round! The annual campaign, which was established in 1984, recognises the contribution volunteers make to our communities every day. Last year in 2017 more than 900 events took place, from awards ceremonies and tea dances to picnics and barbecues. Volunteers’ Week provides a welcome opportunity to collectively shine a spotlight on the people who are making an impact in their community. Our vision is of a society where everyone can participate in their local community through volunteering, and with over 30,000 people volunteering with us each year, we have plenty of opportunities to celebrate the amazing things they achieve. From young people sharing sexual health awareness with their peers to older people who act as mentors or befrienders, or people with disabilities who are supported to volunteer in their local community, to volunteers who support families with children at risk of neglect – amazing things happen every day. So rather than hear from us, we wanted you to hear from the people who give their time and talents all year round to make an impact in their communities. 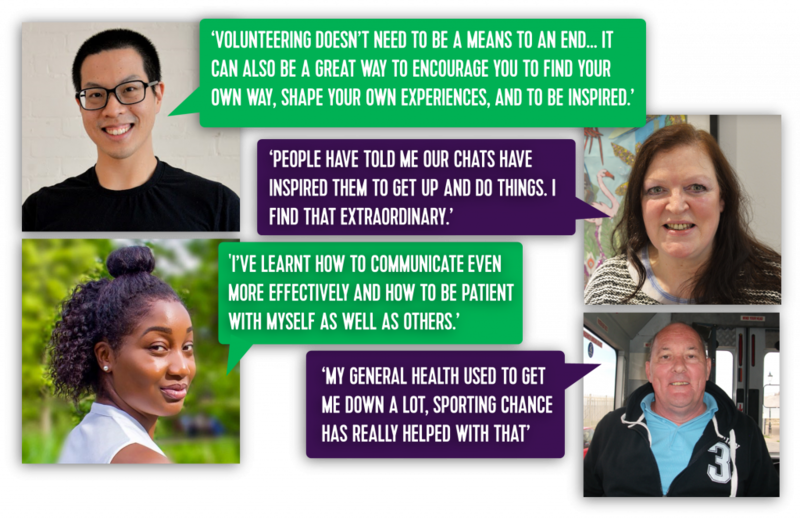 We’d love to hear about how you’re celebrating this week – follow us on @volunteering_uk and share your Volunteers’ Week stories!